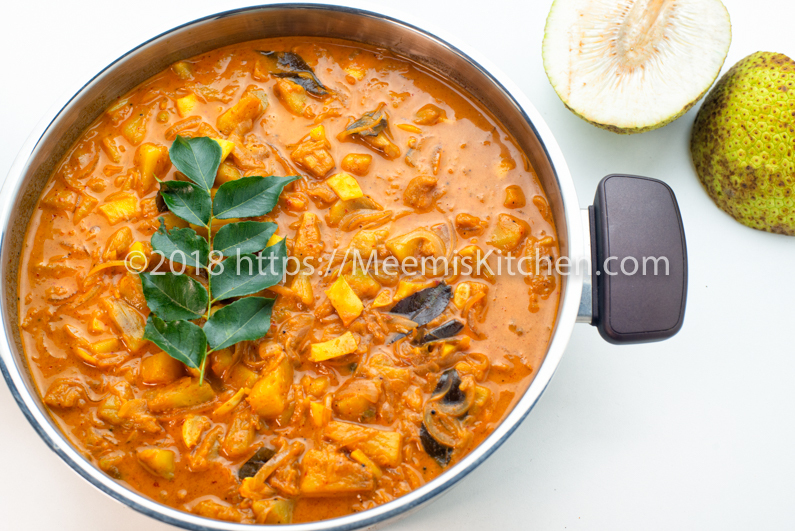 Kadachakka Mappas (Breadfruit Masala Curry) is a flavorful Vegetarian dish, popular in Central Kerala; a great treat for Indian curry lovers. Mostly found in tropical areas, this nutritious Breadfruit / Sheemachakka is cooked when mature. It can be baked, cooked with spices or in curry. Since it imparts fragrance like freshly baked bread when ripe, it is known as bread fruit. In India, Breadfruit or Kadachakka is cultivated mostly in Kerala and coastal areas. My apologies to my loyal readers for not posting for long. I was quite busy as it was vacation time and I had guests at home. Although I was busy cooking, was not able to take photos or write recipes. Now, with the schools reopened, I am happy to be back with my favourite past time – cooking, food styling, and writing recipes. It gives me immense joy to share my recipes with you all, and I am extremely happy to hear that you are trying out my recipes and enjoying them. 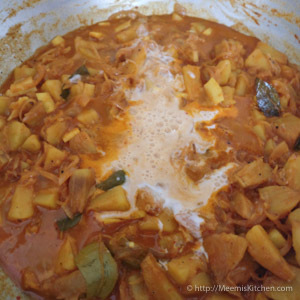 So, here is a wonderful “Kadachakka curry” from my family recipes collection. 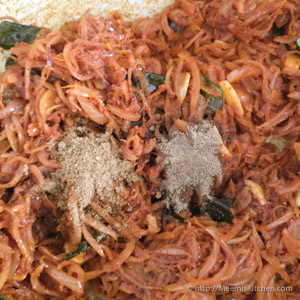 Kadachakka Mappas is a great and healthy side dish for rice. Mature raw Kadachakka is cooked in a spicy and flavourful coconut milk based curry. This Mappas is part of my Childhood memories, as my mom used to make this often at home. Like Vendakka Mappas, Karimeen Mappas, Cauliflower Mappas and other Mappas recipes, this was another favourite mappas dish at home. Breadfruit is packed with nutrients and antioxidants. It is rich in Vitamin C, Calcium, iron and carotenoids with protective health benefits. High in dietary fiber, it helps in controlling blood cholesterol. It is also good for your skin and hair. Kadachakka Mappas is a delicious and pleasing vegetarian dish to have with rice for lunch or dinner. You might also like my other Vegetarian lunch and dinner recipes like Brinjal Masala curry, Paneer Korma, Butter Paneer, Palak Paneer, Aloo Gobi, Soya cutlets, Pepper Mushroom, Soya Manchurian, Mushroom Masala, Bhindi Masala, Vendakka Mappas, Gobi Manchurian, Tomato rice in coconut milk, Paneer pulao, Veg. Pulao etc. Also, check my new recipe for Aloo Shimla Mirch Sabzi, a classic Indian dish with roasted Potatoes and Capsicum. All thanks to my dear Kochammu (my aunt) for bringing them to Bangalore; and to my darling mom for all her help and guidance (the Chakka pieces were uniform and perfect – something I am yet to master) ! I had a feast with Kadachakka mappas and Kadachakka poriyal. Now, I hope you also enjoy the Kadachakka Mappas/ Sheemachakka Masala curry. Bread fruit/ Kadachakka : 1 no. Green chilli : 2 nos. 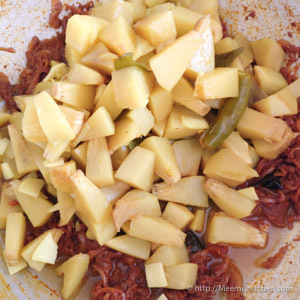 Peel the outer green skin of the Kadachakka/ Breadfruit and cut into quarters. Discard the central core and cut into small even pieces and immerse in salt water. Wash again, drain, cover and cook well in a pan with salt, turmeric Powder (1/2 tsp), Coconut strips, curry leaves, slit green chilies and enough water. The kadachakka should be firm but cooked well. Keep it aside. 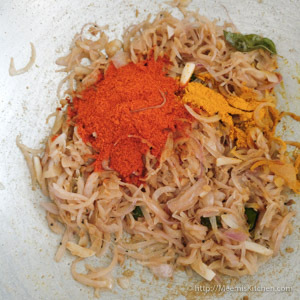 Heat oil in a pan and add curry leaves, sliced onions, garlic and chopped ginger. Sauté till the onions are transparent. Add Coriander Powder first, fry for a minute, then add Chili Powder and Turmeric Powder and fry then lastly add pepper and Garam Masala Powders and fry for some time. 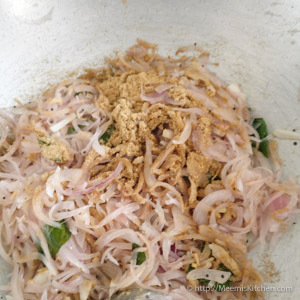 Once the aroma develops add the cooked Kadachakka slices with water if any. Combine well and add the thin coconut milk and bring to a boil. Put enough salt and cover and simmer for some time, till the gravy thickens. Now, add the thick coconut milk and switch off the flame. Mix gently to combine and adjust salt if required. Serve hot with steamed rice, Ghee rice or Jeera Rice. 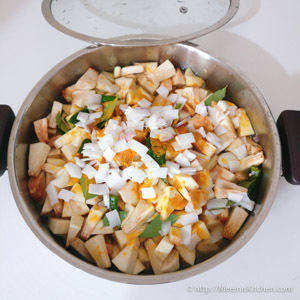 Kadachakka/ Sheema chakka/ Breadfruit should be raw and matured. Ripened ones are not suitable for cooking. Please adjust the spices according to your spice level. Kashmiri Chilli powder is less spicy and adds color. 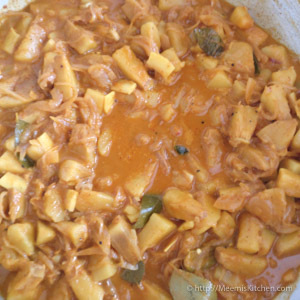 Coconut strips provides a special nutty flavor to the breadfruit curry. For authentic flavours, use only coconut oil. Do not use excess oil; since coconut milk is also added. After adding the spice powders, add little water for frying well. This way, you can limit the use of oil and avoid burning. 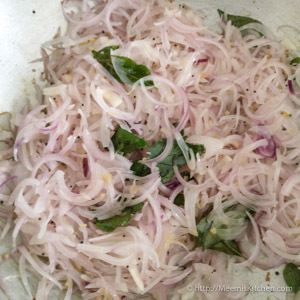 Kadachakka Mappas is a great side dish for steamed rice or ghee rice. I have not used Tomatoes or Tamarind for this recipe, as the breadfruit emanates a wonderful flavor that will be subdued, if tangy. If you like this Kadachakka Mappas recipe, please share with your friends using the buttons on the side and let me know through comments. That would really encourage me to post more. God Bless!! Good and easy making recipe, will try definitely and let u know. Thanks Geetha for your lovely comment. It is quite simple and tasty. Please do let me know after trying.